Bill Samuels, Sr. purchased Burk’s Distillery, outside of Loretto, Kentucky---the distillery that would become Makers Mark--- in 1952. He was no stranger to the Bourbon business. His ancestor, T.W. Samuels, built the first commercial distillery in the state in 1840. Except for Prohibition and a ten-year gap in the 1940s, the Samuels family had produced whiskey continuously. According to legend, the first thing that Bill Sr. did was burn the family’s Bourbon recipe. He wanted to make a product that lacked the rough, bitter quality typical of Bourbon at that time. One of his innovations was to completely eliminate rye from the mash bill. His whiskey was a combination of 70% corn, 16% soft winter wheat and 14% malted barley. The average distillery in America produced 250 barrels per batch; Samuels decided to make less than twenty. His wife, Marge, designed a distinctive square bottle, and insisted that each bottle be hand-dipped in red wax. 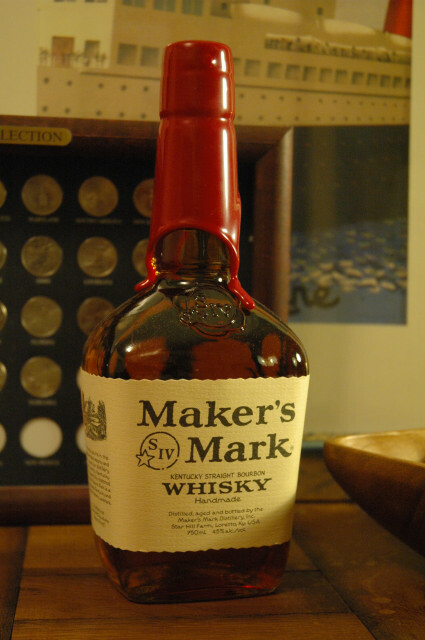 The first batch of Maker’s Mark was released to the public in 1958. For the first two decades Samuel’s Bourbon was only sold within the state of Kentucky, which established an aura of rarity around it. Eventually the distillery passed to Bill Jr., who also grew up in the whiskey business (his godfather, in fact, was Jim Beam). Bill Jr. wanted to keep the sweetness profile of Maker’s Mark but also produce a spirit that was more dramatic, bold and flavorful. He hit on the idea of inserting ten staves of French oak into every American oak barrel for the final three months of aging during the winter. The result was Maker’s 46, a spirit best known for its richness of texture and sensual overtones of vanilla. Maker’s Mark today is in the hands of Bill Jr.’s son, Rob, but very little has changed. 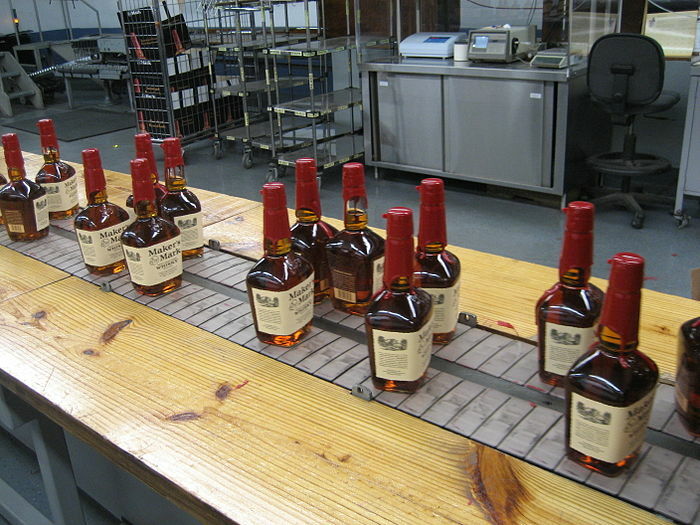 The whiskey is still made in small batches, and the mash bill still contains wheat rather than rye to avoid bitterness. Every distillery in the world, except two, uses a hammer mill to crush grain; Maker’s Mark uses a roller mill, which is slower and less efficient. Rather than put the mash in a pressure cooker for 20 minutes, they cook it slowly for four hours. There are no shortcuts and no compromises. The spirit is generally bottled between six and seven years old, but the determination is taste rather than age. Maker’s Mark is a fanatical believer in the fact that whiskey which is aged too long becomes dried out and overly oaked; during my visit to the distillery, I was given a sample of over-aged Bourbon to prove this, and they were right---compared to the regular Maker’s, it was dull and lifeless. The output has changed, of course. Maker’s Mark was sold in 1981 and passed through multiple stages of corporate ownership---first Hiram Walker, then Allied Domecq and then Fortune Brands, until it came to rest under the umbrella of Beam Global. Production today is around one million cases. The bottles are still hand-dipped in red wax, and you can try it yourself when you visit the property. The distillery hands will cheerfully tell you that they are aiming for the sweetness receptors at the front of the tongue, and one sip of Maker’s Mark ($35, 750 ml) confirms that they’ve hit their target. Scents of caramel, cinnamon, clove and honey on the nose are followed by a spirit which is sweet at first, then spicy in the mid palate. The mouth feel is taut and high-strung, almost electric. Baking spices echo on the long finish along with hints of vanilla and caramel. Purists who are disturbed by the lack of earthiness here (precisely what Bill Sr. was after) may hedge their bets by making a Manhattan with a healthy dollop of straight rye. Maker’s 46 ($45, 750 ml) is even better. The nose is richer and more recessed, with an intriguing suggestion of red fruits and Oriental spices. The texture is ripe and sweet on entry, almost unctuous, followed in the mid palate by a sharp, peppery edge; the sweetness comes back full force on the finish. The aromas and flavor of vanilla is persistent throughout. This is a deeply satisfying spirit, and possibly the best Bourbon on the market in its price range.